Setting the 60-64 US age group record for 5K on the road on October 5, 2014 in Syracuse, NY in a time of 16:58. What are your bio stats? Do you have targets for any purely physical measurements? Preferences: Track training vs. road vs. trail? I would prefer to complete all of my time training on the roads. But in my case, that would be a recipe for disaster, as I would end up getting injured. My college career was not as successful as I would have liked it to be because I was injured a lot as a result of running way too many hard miles on the road. Approximately 50% of my training is on the roads and 50% on the grass. I stay away from trails, as I am concerned that I may trip and fall. At 62 years old, it is easier to break a bone, and injuries take longer to heal. My whole training regime is geared towards remaining injury free. I warm up for the first mile and do not start my watch until I have warmed up. After my workout, I spend at least 20 minutes stretching. If I am sore after a hard workout, I spend 10 minutes in a bath of hot water or the hot tub before I go for a run the next day. I also get a deep tissue massage as often as possible. The V.A. Mountain Home in Johnson City. I have been running there since September 19, 1973. I can run on the roads or a combination of grass and pavement. The roads in our area are so crowded that running at the V.A. Mountain Home is one of the safest places to train. The Complete Book of Running, by Jim Fixx*. I am not sure if this book is still in print. It was a book that I thought gave the average person some great tips on how to become a successful novice runner. However, I have learned a lot about what works for me by just running. Like the Nike ad says, "Just do it". I run approximately 30-40 miles a week. Some folks will look at that and say that's not much. One thing I want to assure you is that there is no junk in my training. My motto is quality not quantity. Most of my runs are completed at an average pace from 6:10 to 6:25 a mile. I run hard 5 to 6 miles a day, six days a week. Weight: Do you intentionally try to lose weight to run faster? When I train hard I lose weight and I would never try to diet to run faster as I feel this would take my strength away. We eat at home most of the time. Our meals are fresh vegetables, lean meats, fruits and nuts. This is not a dieting regime, it is just good common sense eating. Shoes: Trainers: Stock or how do you modify? I have worn Gel Nimbus running shoes for years. The only modification I make is to replace the original insoles with Montrail insoles. I also wear the same shoes racing as I do in training. I do not wear flats in competition and have had some comments made because of that. In the USATF Masters Outdoor 5000 meter 60-64 age division Track Championships in Winston Salem on July 17, 2014, there were a couple of comments made to me about how much slower racing in training shoes made you. At the end of the race I lapped all of the other competitors at least once on the way to running 17:23. Needless to say when I lined up for the 10,000 meters two days later, there were no comments about my shoes. 5K is now the distance I like to run. 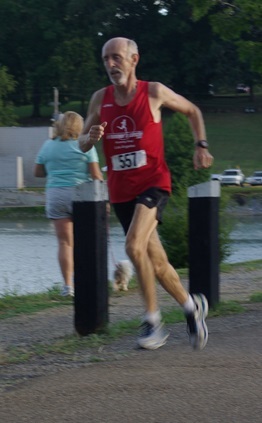 I still have a lot of speed, but at age 62, I don't recover as quickly and realize that I don't have as much strength as I once did for longer races. Do you ever start a race planning to race a person? Yes. I have done it in the past. The latest time was at The Santa Anita Derby Day 5k held in Arcadia, California on April 9, 2016. I looked at the results from 2015 and picked out Simon Cooper, age 45, who had run 17:32. I knew he had registered for the 2016 race, and he was the guy I was going to run out with. Before the race began, I wrote his bib number on my right hand. He was standing near me at the starting line. That is the last I saw him until we finished. I ran 17:40 and he ran 17:57. After the race, he came up to congratulate me and I showed his bib number written on my hand. He was a good sport and we had a good laugh about it. The USATF National Masters 12K Road Championships in Alexandria, VA On Nov. 16, 2014. I broke the US Masters 60-64 US record in 2013 in 43:04 so there was a lot of pressure on me coming in to the 2014 race. On race morning it was very cold and windy, and after the first mile, I was left in no man's land between the leading group and the chasers behind me. At the half way point, we turned around into the wind and I really had to work hard to keep even splits. Even though this race was difficult because of the pressure and the great competition, I ended up breaking my 2013 record and ran 42:50, another US record, at the 2014 USATF National Masters 12K Road Championships. Tapering prior to a race? I always take Friday off. Most often I race on Saturday, but I run hard every day and this seems to work for me. There is no particular meal that I tend to eat before a race. However, the day before a morning race I normally eat my biggest meal at lunch and a light meal at supper. The morning of the race I get up 3 hours before the event, eat a banana and drink 8 to 12 ounce of water so I stay hydrated. I always try to eat no later than two and a half hours before I race. I spend about 15 minutes warming up before a race. I don't stretch before competition, only after. Adjusting your splits is just part of the process when you compete. The only adjustment I occasionally have to make is to slow down my pace as I never go out too slow. I shorten my strides when running uphill. I jog at least two miles after a race and spend at least 20 minutes stretching. The next day I get out and swim for 20 minutes or get into the hot tub for 10 minutes. I then hit the roads or the grass at my usual fast training pace. Do you ever get night leg cramps and if so, what do you do about it? Leg cramps have not been an issue for me.